The songs on this album were written about people and events from port towns of Dublin, Belfast, Portsmouth and Rotterdam. Paul in accompanied on this CD by Kate Huber from Seattle on flute. These songs take you on a musical journey in time and place, from the Ouzel Galley Saga from the late seventeenth century right through to the present day, taking in tales of Captain Bligh, Admiral William Brown, the demise of the sailing ships, the shipbuilding industry, tattoos, the whaling industry, true love and contraband. Paul has painted pictures of the many different aspects of a Port, highlighting the parallels and the links between them, whether Dublin, Belfast, Portsmouth or Rotterdam. 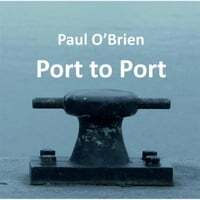 ‘Port to Port’ reflects Paul’s own musical journey, from one port to another and all the people he has met on the way….….